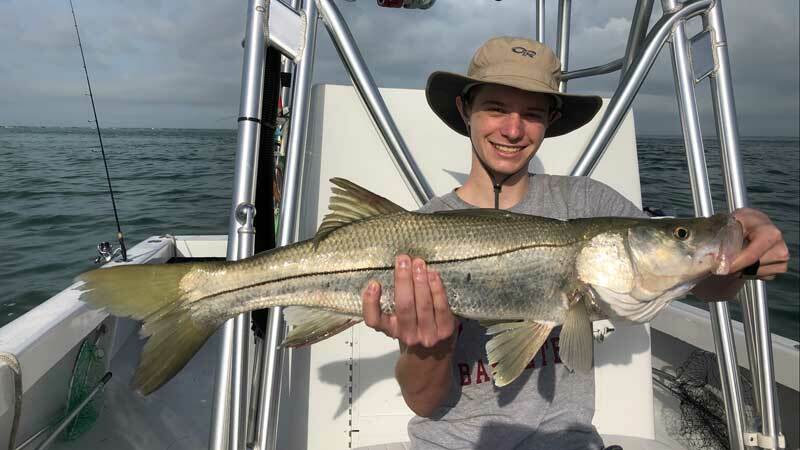 Michael Gadek, visiting Anna Maria Island from Lake Bluff, Illinois, shows off a nice snook caught on a live pilchard Jan. 5 while on a guided fishing trip with Capt. David White of Anna Maria Charters. 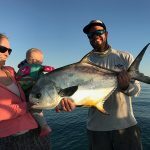 In spite of cold fronts sweeping down from the north early in 2019, fishing around Anna Maria Island remains consistent for a variety of fish. Bottom fishing around ledges, reefs and wrecks is yielding a fish on just about every bait. Mangrove snapper are dominating this bite, followed by Key West grunts, sheepshead, porgies and groupers. You can add lane and yellowtail snapper to the list — if you’re lucky. Changing baits to live shiners or cigar minnows is producing amberjack, which is always good for those looking for a “reel” workout. 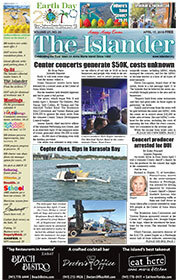 Inshore fishing around Anna Maria Island is producing good action. Fishing structure for sheepshead seems to be getting better and better as winter progresses. Most are 2-3 pounds, which is perfect eating size. Fishing docks inshore is producing good action on black drum, mangrove snapper and catch-and-release redfish. All three species are readily taking live shrimp. Lastly, jigging the flats for spotted seatrout is proving to be worthwhile for anglers. Keeper-size trout are being found on channel edges where the shallow grass flats meet with deep water. On my Southernaire charters, I’m enjoying the sheepshead bite. My anglers are averaging 10-15 keeper fish per trip. When catching the sheepies on structure, we also are reeling up plenty of Key West grunts and mangrove snapper, which is resulting in some good-looking fish boxes at the end of the day. I’m finding black drum and catch-and-release redfish on my travels, which provide anglers with great action. To finish out the day, I’m drifting over deeper grass flats and jigging for spotted seatrout. Soft-plastics on a jig head are yielding numerous trout, as well as a few pompano. Capt. Warren Girle is focusing his efforts on nearshore structure and ledges. In depths of 25-45 feet of water, Girle is finding a variety of species. Baiting with live shrimp is attracting fish to his client’s hooks on nearly every drop. Mangrove snapper are the most prominent, followed by an array of other fish, including sheepshead, porgies, grunts and juvenile groupers. During his travels in the Gulf of Mexico, Girle is finding the random tripletail lazily floating along in the current where grass or other debris is present. Moving inshore, Girle’s clients are hooking up with black drum, sheepshead and catch-and-release redfish by casting live shrimp under docks and around seawalls. Capt. Aaron Lowman is venturing into the Gulf of Mexico when the waters are calm and the winds are light. Using live shrimp combined with a knocker rig, he is dropping baits down to structure to find a bite. Ledges, reefs and wrecks are host to a plethora of species, including snappers, grunts, groupers and sheepshead. 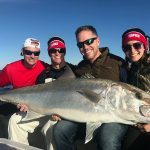 On windier days, when fishing in the Gulf is less favorable, Lowman is returning to the Intracoastal Waterway and its connecting waters. By fishing docks with live shrimp, he’s putting clients on black drum, sheepshead and catch-and-release redfish. Jim Malfese at the Rod & Reel Pier is seeing sheepshead being reeled up to the deck quite frequently. Pier fishers using live shrimp as bait are casting under the pier to attract these ever-popular fish to the hook. While targeting sheepies, black drum, flounder and an occasional catch-and-release redfish are finding their way to the hook. Pier fishers casting live shrimp out from the pier into Tampa Bay are hooking into pompano. Tipping small jigs with pieces of shrimp is working well to catch a pomp. In fact, this method is producing better results than just casting out bait and waiting for a bite. Capt. Jason Stock is spending most days offshore in the Gulf of Mexico. Fishing wrecks is yielding 60-80 pound amberjack. Also, while wreck fishing, Stock is reeling up numerous mangrove snapper in the 20-inch-plus range. Moving inshore to the flats, Stock is finding some great catch-and-release snook action for his sport fishers. Mixed in with the snook bite are spotted seatrout and catch-and-release redfish. Capt. David White of Anna Maria Charters is working his charters inshore for sheepshead. Casting live shrimp around rocks and docks is producing respectable numbers of sheepies, as well as a mix of other fish. Black drum are crazy about shrimp and are being caught with some regularity. The same applies for catch-and-release redfish. Changing tactics to fish for pompano is producing action for White. Casting Doc’s Goofy jigs throughout the flats, channels and passes is stirring up an occasional pompano bite.